Family time, shopping trips, and fun! But what also comes with this time of year is lots of sugar, salt and fat! It’s all good, as long as you have a plan to keep consistent with healthy eating and effective exercise, so that you can indulge in the fun every once in a while and not feel deprived. We put so much stress on ourselves to be perfect at staying healthy and then one misstep sends us into a tailspin of overindulgence and punishment. There’s a better way and that’s why I’ve put together my top tips for nutrition, exercise and mindset strategies, including my #1 strategy of “frontloading” so you can be prepared for whatever the day brings and still feel in control. It may even help you slide into your favorite jeans and or ROCK that little black dress on New Year’s Eve! Cut down on your salt and start using natural seasonings and herbs to enhance the flavor of your more basic foods. Experiment with an organic seasoning mix that has no added salt or grow a couple basics like basil, rosemary and oregano and see how well it livens your taste buds. 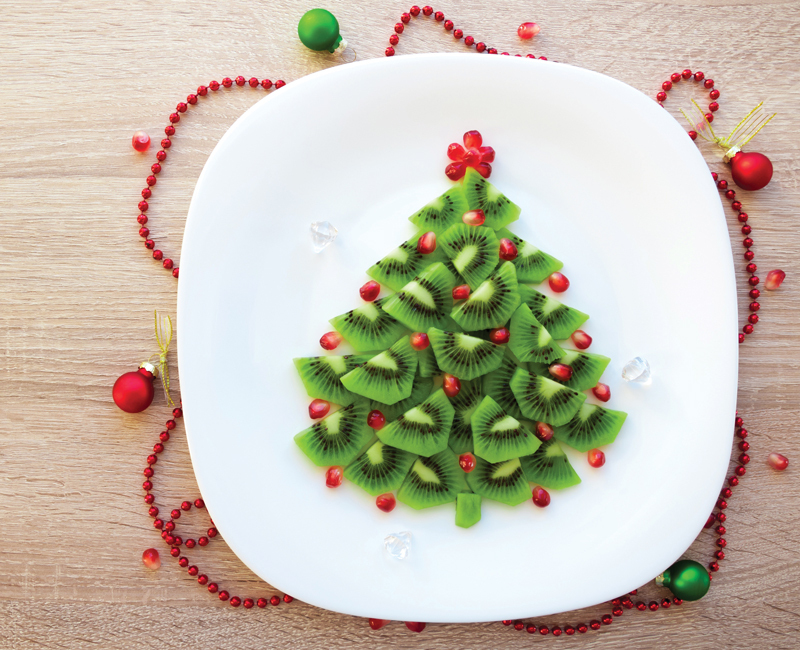 If you find yourself eating cookies, chocolate and desserts a little more than normal, it’s time to reduce your added sugar sources and use fibrous fruits and natural sweeteners to help satisfy that sweet tooth on days when you are not celebrating. Reduce your “bad” carbs down by limiting white flour, processed foods like crackers, cookies and pasta. Add more “good” carbs like fibrous veggies and fruits. Appetizers tend to be the biggest offender, so volunteer to bring one that is healthy and full of protein and fiber to guarantee a good option. Make a sandwich that’s portable and easy by switching out the bread with a big piece of romaine lettuce. Start spiralizing zucchini, squash, turnips or even sweet potatoes and use in place of traditional pasta. Holiday “toasting” lingers throughout the season and it’s important to be aware of added sugars. Try sticking to the cleaner vodkas and tequilas and mix with seltzer and fresh squeezed juice. Adding things like basil, mint or lavender can liven them up without the added calories and sugar. Don’t forget to alternate a glass of water or seltzer between drinks to help you limit overall. Make sure each meal includes protein, so you can help build muscle and balance blood sugar. Protein can help your body breakdown and digest your meal slower, so you don’t get a spike in blood sugar from the carbs, allowing you to sustain your energy levels longer. Waiting to eat protein until the end of the day makes it hard to consume the amount you need when strength training. Build muscle by lifting weights while still performing cardiovascular exercise in a sequence that helps the body burn calories during and after the workout. Use a series of exercises that works many muscles groups and provides a “cardio burn” while increasing your muscle’s ability to utilize glucose. Choose a weight that challenges you to fatigue, but allows you to keep up the pace. Stick to 30 minutes, to keep cortisol from rising too high and causing the negative effects of fat deposition around the belly. Leave the guilt by the curb. Start by accepting the fun and enjoyment of the holidays and don’t let guilt get in your way. So, you ate a couple more treats and had a little more alcohol than normal, so what! A healthy life is about finding balanced enjoyment. Plan for good days and bad days. The week between Christmas and New Year’s brings about some down-time but also more entertaining. Eat well and get your exercise in on the down days and front load the entertaining days with a good breakfast and lunch and a relaxing walk outside. Be focused, but realistic. Set a goal for yourself, let others know what you are doing so you can avoid some outside pressure to “cheat” and make sure it’s realistic for your time frame. Find some time for stress reducing activities. Read a book, go on a hike, do some yoga, take a nap, etc. Allowing your body and mind to reset is so important and can really help you in the long term to reach your weight loss goals. Frontloading Nutrition and Exercise Tips to start your day off right. Eat a protein packed breakfast and lunch with some quality fats and good carbs before heading off to a late afternoon event. If you provide your body with the food it needs to feel full and energetic throughout the day, you will be less likely to “dive” into the apps or overdo the desserts! Plan to exercise early in the day before an event or family activity so that you ensure it gets done and you prime your body for consistent energy burning throughout the day. This works especially well when holiday shopping and prep levels heat up and we feel exhausted by 5pm, not to mention holiday happy hours pulling you away from your workout plans. Aimee Chandler, has a Master’s degree in Exercise Science from the University of CT and is certified in many fitness programs. She has been teaching group fitness classes and personal training for over 25 years. She is the founder of Aimee Chandler Wellness, which focuses on helping busy women find life balance through moderation and consistency. She lives in CT with her husband, a Physical Education teacher and her 2 young children. Her passion is helping others in their pursuit to live a healthier life, find self-acceptance and reach their full potential. Visit her website at: www.aimeechandler.com or contact her directly with any questions at: info@aimeechandler.com or 860-985-7957.